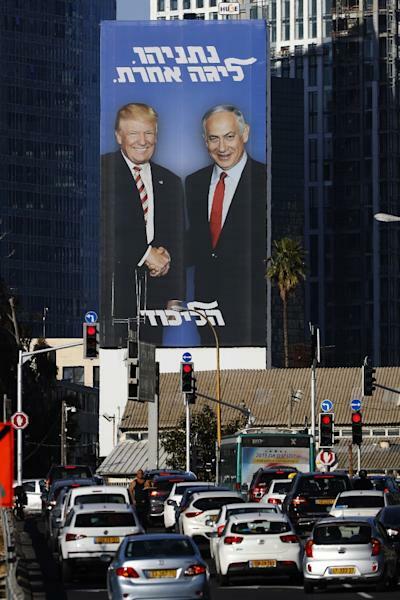 A giant election billboard of Israeli Prime Minister Benjamin Netanyahu and US President Donald Trump, with a slogan in Hebrew: "Netanyahu, in another league"
Jerusalem (AFP) - A giant billboard advert in Tel Aviv features Benjamin Netanyahu and US President Donald Trump grinning and shaking hands, as Israel's prime minister cranks up his campaign ahead of April elections. 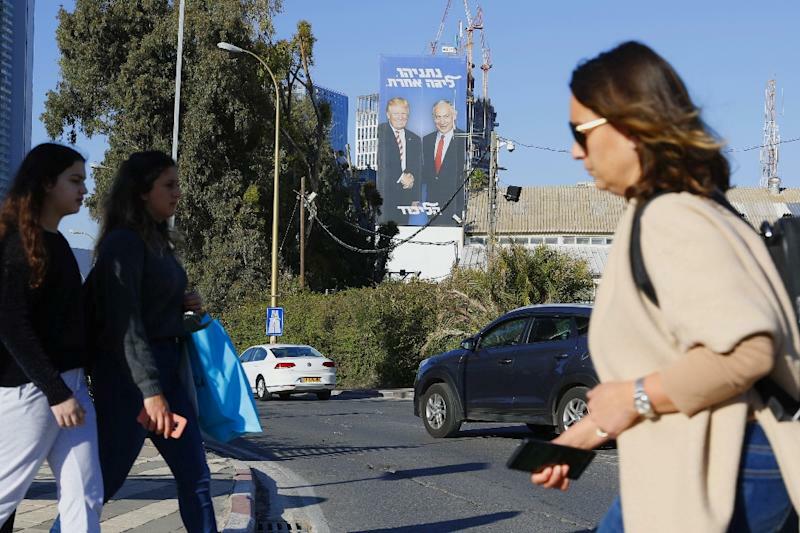 The 20 metre by 10 metre advert -- with the slogan "Netanyahu, in another league" in Hebrew -- is plastered above a busy traffic junction, and the poster has gone up elsewhere in Tel Aviv, Jerusalem and other cities. Photos of the billboard have been trending on social media networks. 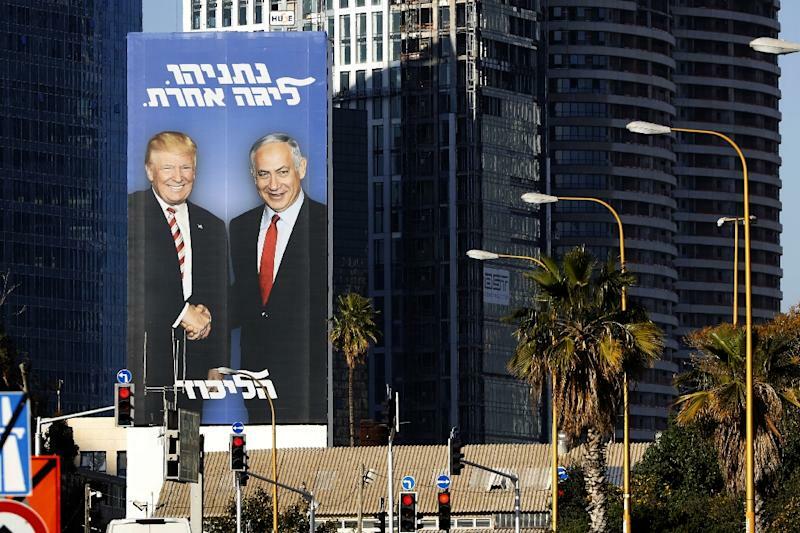 The Israeli premier has built a strong relationship with Trump, whose administration in December 2017 recognised Jerusalem as Israel's capital. Netanyahu has repeatedly flagged this decision as evidence of his ability to influence the US president. The US move delighted Israel, which sees the entire city as its "eternal and indivisible capital". But it was condemned by the international community, which has never recognised the Jewish state's 1967 occupation and later annexation of Arab east Jerusalem. The unilateral recognition enraged Palestinians, who see east Jerusalem as the capital of their own future state. The US moved its embassy from Tel Aviv to Jerusalem on May 14, 2018. At least 62 Palestinians were shot and killed by Israeli fire in protests along the Gaza border that day. Opinion polls show Netanyahu -- who has been in power for nearly a decade -- is well placed to form another coalition government after legislative polls set for April 9. But the veteran premier faces potential corruption charges, with media reports suggesting the attorney general might begin legal proceedings before the April vote.